Please refer to our stock # 1120 when inquiring. 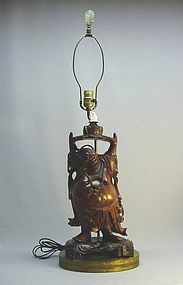 This early 20th century Chinese wood carving of Budai or laughing Buddha mounted as a table lamp is 33 3/4” high, 10” wide and 8 ½” in depth. The wood carving is 18 ½” high, 7” wide and 6” in depth (from the base). The laughing Buddha is raising both arms holding a large lotus leaf which has another small bone carved sitting Buddha attached to the top. The laughing Buddha is not carrying his “cloth sack” on his shoulder; instead, he is stepping on the sack. This makes the image more interesting and unusual. Aside from some cracks due to the age, it is in great condition.